Kathmandu, Chitwan, Lumbini and Pokhara are the treasures of Nepal. Tour to this four gems gives you the glance of Nepal's cultural heritage, its history, people's lifestyle, and naturally gifted several attractions. The journey begins with a heritage sightseeing tour in Kathmandu. Then, continue to Chitwan to experience the jungle safari in its dense forest and explore the wildlife. Similarly, drive to the birthplace of Lord Buddha and visit the sacred site and monasteries. Discovering Nepal's lowland attraction, the trip continues to the hilly region of Pokhara. Surrounded by the Annapurna Mountains and giant green hills, Pokhara is the city of lakes, caves, and much more. Day 02: Kathmandu Sightseeing Tour and drive to Nagarkot. Morning participates in the breathtaking one-hour mount Everest view flight. Early morning transfer to the airport and perform the adventurous mountain view flight. The flight provides a marvelous opportunity to observe the worlds' tallest mountain Mount Everest as well as other neighboring Himalayas. Back to the hotel and refresh. Then, proceed to visit the UNESCO World Heritage Sites around the valley. Visit Pashupatinath Temple (the biggest Hindu Temple), Bouddhanath Stupa (the biggest Stupa), Swoyambhunath Temple (also known as Monkey Temple), and Kathmandu Durbar Square. Completing today's tour drive to the hill station at Nagarkot. Overnight stay at Nagarkot. Day 03: Kathmandu Sightseeing Tour. Early morning views the sunrise over the magnificent mountains and back to Kathmandu. On the way, visit an ancient Changunarayan Temple, Bhaktapur Durbar Square, and Patan Durbar Square. Afterwards, transfer to the hotel. Overnight stay at Kathmandu. Day 04: Drive to Chitwan. You will be picked up from your hotel early morning and prepare for the trip. Drive to Sauraha. It is 175 km far from Kathmandu and takes around 6 hours. After arrival, you will be transferred to the resort and hotel check-in. The nature guide will be briefing you about the activities. Take lunch at the resort and proceed to Elephant Safari. In the evening, enjoy the Tharu Cultural Dance Show. Overnight at Chitwan. Day 05: Chitwan Jungle Safari. Day 06: Drive to Lumbini and Sightseeing Tour. Breakfast at the hotel and today drive to Lumbini, the birthplace of Buddha. It takes around 4 hours drive and transfers to the hotel. After short refreshment visit Maya Devi Temple, Ashoka Pillar, Holy Pond, Sacred Garden, and Eternal Light. 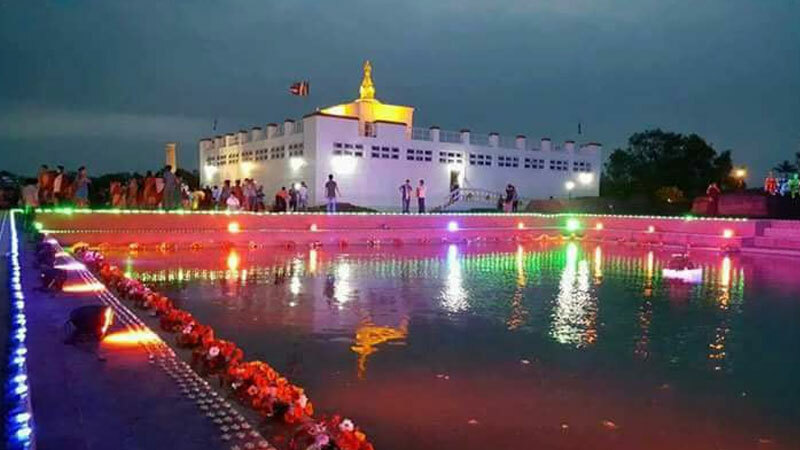 Overnight at Lumbini. Day 07: Drive to Pokhara. Morning visits the monasteries built around Lumbini at Monastic Zone like Chinese Monastery, Korean, German, Nepalese, Indian, Bhutan and many more. Afterwards, continue the journey to Pokhara. It is 7 hours driving distance from Lumbini. Arrival at Pokhara and take rest. Overnight at Pokhara. Day 08: Pokhara Sightseeing Tour. Take breakfast and you will have free time until 12 noon (hotel check out time). Then, transfer to the international airport for your onward destination. The time has come to say goodbye and bring the beautiful memories with you. Kathmandu, Chitwan, Lumbini, and Pokhara Tour Trip finished here! Twin Bed sharing (2-5 star) hotel accommodation at Kathmandu, Nagarkot, Chitwan, Lumbini, and Pokhara. Kathmandu to Chitwan to Lumbini to Pokhara and back by private vehicle. Entrance/Monument Fees during sightseeing at Kathmandu, Pokhara, and Lumbini. All the activities at Chitwan as mentioned in the itinerary. Wants some modification on Kathmandu, Chitwan, Lumbini and Pokhara Tour itinerary? contact us to customize it.